If you’ve been inactive for a fair amount of time, entering the world of consistent exercise can be daunting. A lot of people don’t know where to begin or what to do, and they also may not know their limits or how to stay safe when trying new forms of exercise. If you’ve been sedentary for a long period of time due to illness, pregnancy complications, or even just because of inactive employment, follow these guidelines to help keep your knees safe as you successfully increase your activity level. Sometimes, people might put off exercising because they are worried that it will make their knees hurt. People who lead sedentary lifestyle can experience knee pain, and the cause of that knee pain is inactivity. 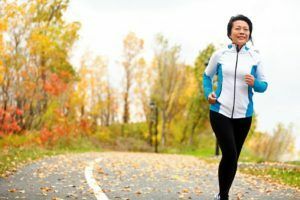 In these cases, increased exercise is the cure for knee pain, so don’t be afraid of starting moderate exercise. Your knees can hurt a bit when you start walking, doing a slow stair climb, or even when you begin doing yoga. With prolonged underuse, the tissue supporting your knees can become weak. Your leg muscles that also support the knee get weaker as well. Don’t quit exercising if you notice a bit of discomfort in your knees and other joints; your body needs to time to adjust to the increased stress of exercise. A little tightness or aching as you get started is normal, especially if you already had some knee pain to begin with. Instead, focus on stretching to increase your flexibility and to encourage your leg muscles to loosen after exercise. They will tighten up with a sudden increase in activity, which can cause discomfort in the knee. However, do see a doctor before beginning any sort of workout plan. Knee injuries require extensive rehabilitation, so you don’t want to hurt yourself with overexertion. If you notice significant pain, difficulty placing weight on your leg, or pain that gets worse instead of better, stop exercising until you can see a doctor to rule out an injury. When you plan your daily exercise, give yourself plenty of time for a warm-up. Warming up your muscles and joints can help prevent knee pain, and it can also help to reduce the risk of injury. Squats, a few minutes pedaling a bike, or child’s pose in yoga can help get your knees ready. You can also do some knee bends (do them while lying down on your stomach if you don’t feel stable enough to do them standing). Your doctor might also suggest special exercises to increase your knee stability and strength. Cooldowns are also important. Stretch your knees again, and drink plenty of water to prevent any muscle cramps in the legs. Variety is the spice of life – the savior of underused knees. Your knees need to become strong again, but doing the same exercise each day will not do the trick. Instead, you should focus on several different types of low-impact exercises. You might take a brisk walk one day, ride a stationary bike the next day, do some light weightlifting another day, and finish the week with swimming. Try to avoid any high-impact exercises until you’ve gotten into a pretty consistent and successful exercise routine. Avoid exercises that require a lot of jumping, running, switching directions, or sudden stops. You can successfully increase your fitness without high-impact workouts: water aerobics and ballroom dance classes are great for your heart rate and your knees. For more information about starting to exercise after a long period of inactivity, contact us at Noyes Knee Institute.